This recipe for potato salad is the best. The best! And the reason is the addition of crispy back bacon and pureed chipotle peppers. A great side dish to make for dinner or enjoy it on its own for lunch. Tastes good served warm or cold. A deliciously hearty salad of chickpeas, mandarin oranges, almonds, goji berries and feta cheese. 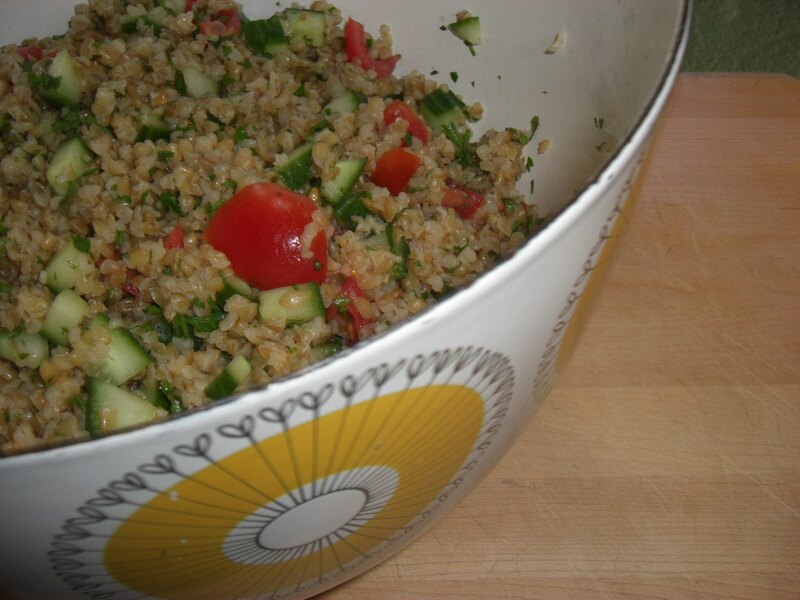 Like tabouli, this version uses couscous instead of bulgar to give it a lighter texture. The salad dressing makes this salad, feta yogurt dressing. A fresh and crisp salad of green beans with toasted sesame oil, ginger and soy sauce. This recipe would make a great side dish to anything. This salad has quickly become a favorite amongst friends, it's a healthy combination of raw kale, carrots and red cabbage. This makes a great side dish or light lunch with plenty of leftovers for tomorrow. It's also a great potluck salad. A delicious southern salad dressing made with balsamic vinegar, maple syrup and chipotle peppers in adobo sauce. A quick noodle salad made with pad Thai-style rice noodles, tofu and veggies. A tasty and light pasta salad with a name that says it all. With a delicious combination of flavors and plenty of ingredients, this is a great main course salad. A delicious way to make a hearty salad. Soba noodles are lighter then their Italian cousin and quicker to prepare. Fava beans, thinly sliced fennel with Parmesan cheese and mint. This recipe for tomato, basil and bocconcini salad is a authentic Italian dish. Simple, fresh and rustic.